Home » When Should You NOT Use Defibrillator? If the victim is in water or is wet for any reason. If the victim is surrounded by the combustible material. If the victim is less than 12 months old. In all other situations in which you are dealing with a person who is unconscious and unresponsive, you should perform CPR and use the AED. Whether the AED will or will not administer the shock is not up to you. The device itself will analyse the pulse and make that call for you. For this to happen, you need to have a functional AED ready and easily accessible in your workplace. Get it today from Alsco New Zealand for a monthly fee. When Should AED Be Used? AED should be used in case of a cardiac arrest. The symptoms of a cardiac arrest usually include an sudden collapse with irregular or no pulse or heartbeat. The victim is unresponsive, so they don’t react to your calls, shakes and touches. However, cardiac arrest and heart attack are very similar in their symptoms. While AED can help with the cardiac arrest, it is not effective in the case of a heart attack. If the person is suffering a heart attack, the only thing that can help them survive until the ambulance arrives is CPR. The AED shock will do no harm, but it will do no good either. 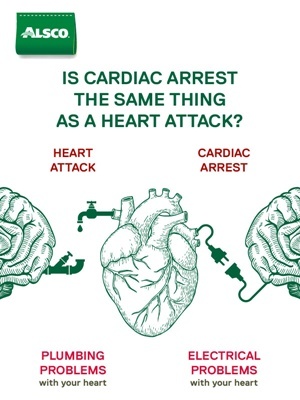 So, how do you know if the person is having a heart attack or a cardiac arrest? You don’t. There is no time for you to make these conclusions and diagnose the condition. If you determine that there is no pulse or the heartbeat is irregular, don’t hesitate and start with the CPR and AED immediately. While AED won’t help with the heat attack, it will not do any harm either, so it is best to cover your bases, just in case. AED simply won’t administer a shock if the heart rate is not “shockable”. Should AED Be Used Before or After CPR? You need to start CPR the moment you see that a person has collapsed and doesn’t have a pulse. CPR is used to continue the blood flow that has stopped due to the heart failure. If the blood stops, brain doesn’t get its oxygen and can die. CPR should be done immediately while the AED is set up. Shout for help if there is anybody nearby who can hear you. Tell them to call 111 and ask for the ambulance. Grab the nearest AED and start performing the CPR while the other person sets up the AED so you can use it, preferably within a minute. How Long Should You Perform CPR after a Successful Shock from the Defibrillator? Generally, the AED should be performed as soon as possible, but some researches showed even a minute-long CPR before the AED shock helped the outcome of these first aid efforts. Setting up your AED will last at least a minute and there is no reason why that time should not be used for CPR. In that way, you have prevented the complete halt of the blood flow, which is essential for the preservation of all important organs and tissues and you have administered the shock within the first two minutes from the moment of the accident, trying to restore the electrical function of the heart. When Should You Stop CPR? There is an obvious sign that the person is better. They are breathing and/or are responsive. A trained medical professional has arrived to the scene and is taking over. You have done 40 pushes and you are quickly checking for the pulse. In other words, unless the person is well, don’t stop with the CPR until ambulance has arrived and somebody is taking over the CPR from you. What Are the Chances of Survival When Using AED? This depends on the time that has passed from the moment you the cardiac arrest happened and the moment you have started the defibrillation. According to the USA researches and findings, if you shock somebody’s heart with an AED within a minute of their cardiac arrest, their chances of survival are 90%. With every minute passing, those chances drop from 7% to 10%. The Australian resources claim that the success rate within the first minute is 70%. 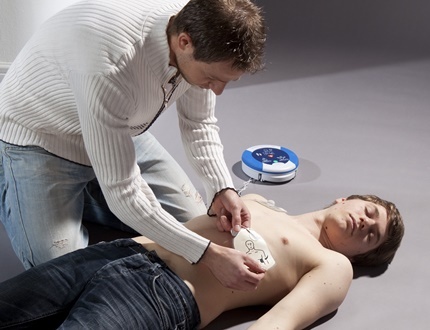 There have been initiatives around the world for the portable defibrillators to be placed in the public places. This also happens in New Zealand. Due to the importance of the quick response and the timely use of the AED, it is logical that people want to have it nearby at all times. The majority of cardiac arrests that turn out fatal happen in home. This is because there are no AEDs in most households and while the ambulance arrives, it is usually too late to help. Some of the cardiac arrests will happen in the workplace. Those who already have heart issues are in greater risk of suffering a cardiac arrest than those who don’t. You can never be 100% sure that all your employees are aware of the state of their heart. Therefore, you need to do whatever is in your power to make your workplace as safe as possible for everybody. This includes acquiring portable AEDs and installing them, so that they are always within a reach. There is no need to buy so many AEDs. You can rent them from Alsco New Zealand for a reasonable monthly fee. Call Alsco NZ today and get your workplace AEDs.